PENICHE, Portugal (Thursday, October 18, 2018) - The penultimate event on the Men’s World Surf League (WSL) Championship Tour (CT), the MEO Rip Curl Pro Portugal, resumed in firing eight-to-ten foot surf (2.5 - 3 metre) for a third full day of action to decide the event’s first Quarterfinalists at Supertubos. The day witnessed incredible performances from the world’s best surfers, heavy wipeouts as competitors chased big barrels, and a major upset in the World Title campaign. In order to stop current World No. 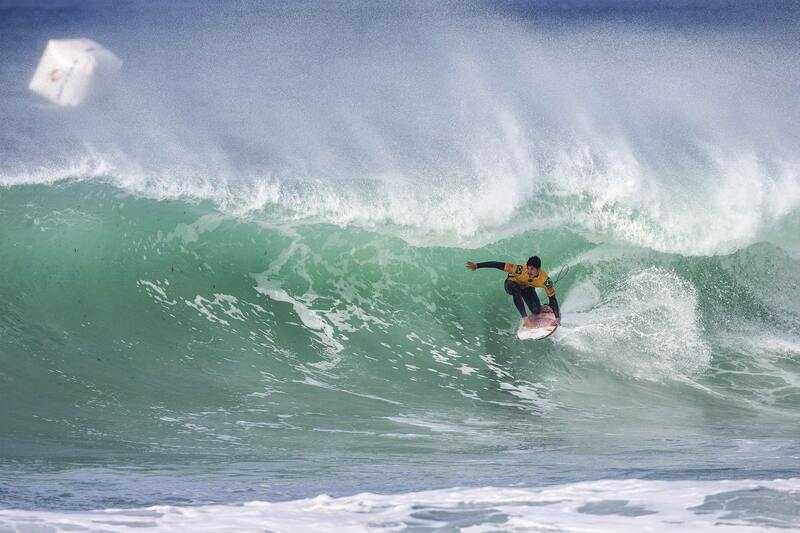 1 Gabriel Medina (BRA) from winning the title at the MEO Rip Curl Pro Portugal, No. 2 Filipe Toledo (BRA) had to win his Round 3 heat to guarantee a 9th place finish. In a dramatic turn of events, World No. 33 Joan Duru (FRA) upset Toledo’s World Title plans with a win in their Round 3 matchup. Duru started well with a smaller backhand barrel for a 6.50 (out of a possible 10) to take the lead with a minor backup score. Toledo reacted and got a clean - but short - tube, complemented with a couple of turns for a 5.43. He quickly found a better wave to post a 6.67 to turn the heat with a combination of four good turns. But the Frenchman got one final opportunity where he locked in a quick barrel and finished the wave with three turns for a 6.00 to upset the World Title contender right on the buzzer. With Toledo now eliminated from the competition, Medina has one less opponent to stop him from clinching the title early in Peniche. Current World No. 3 Julian Wilson (AUS) needs to make the Semifinals in order to push the World Title race to the Billabong Pipe Masters this December. Toledo could also lose his No. 2 spot if Wilson keeps his excellent form and posts another big result in Portugal. By the time Round 4 hit the water, the tide had dropped and some of the waves squared off to provide huge drops into Pipeline-esque barrels. The second heat of Round 4 carried huge World Title implications as Medina took on Michel Bourez (PYF) and local hero Frederico Morais (PRT). Medina, 2014 World Champion and Jeep Leader, was the first surfer to find a couple of decent waves to exploit on his backhand with quick turns for two 5.00 point rides for the lead. He continued to build momentum and found a 6.67 to strengthen his position. Behind him, Bourez found a couple of small scores to place second and unfortunately for the huge crowds, Morais could never find any score in a difficult lineup. Medina advancing into the Quarters means he still has a chance to clinch his second World Title early when competition continues. Wilson made sure to advance through to Round 4 to have a shot at stopping Medina’s possible title run in Peniche. The Australian, fresh off a win in France, locked into a long and deep barrel on his forehand to post the day’s highest single number of 8.67 and take a crucial win over Ian Gouveia (BRA). The other standout of Round 3 was his compatriot Owen Wright (AUS) who tied with Wilson with an 8.67 of his own, for a late drop into a cavern on his backhand, coming out with the spit and into a big snap for the win into Round 4. Adrian Buchan (AUS) will join Wilson and Wright in the last heat of Round 4 when the event resumes. Round 4 Heat 1, between Italo Ferreira (BRA), Matt Wilkinson (AUS) and Ezekiel Lau (HAW), offered a few great waves, starting with Ferreira’s 7.33 backhand barrel. The Brasilian backed up his main score with a two-turn combo for a 7.27 and a firm hold on the lead. Wilkinson found a similar left to lay two big turns for a 7.47 for second place. Lau, on the other hand, committed to a couple of big drops to deep barrels but couldn’t find the exits and finished his heat with two minimal scores, eliminated in Equal 9th. The third heat of Round 4 wrapped up the action for the day with a battle between Kanoa Igarashi (JPN), Wade Carmichael (AUS), and Duru. Duru and Igarashi shared the action for the first twenty minutes, building a healthy scoreboard each, while Carmichael stood patiently in the lineup only opting to surf his first wave with ten minutes remaining. Duru’s backhand vertical attack gave him the lead with 11.50 over Igarashi’s 9.10. Carmichael only came back extremely late in the heat and didn’t have enough time for a second decent score, ultimately placing Equal 9th. Duru advanced into the Quarterfinals for the first time this season and will need a strong finish in Portugal and Hawaii if he wants to keep his spot amongst the Top 34 next season. He is currently ranked 33rd on the Jeep Leaderboard with only the Top 22 earning places on the men's Championship Tour. A few other surfers lost big in Round 3, starting with World No. 10 Kolohe Andino (USA), who collected a second consecutive 13th place after France, after finding an in-form Lau on his way. Andino and Lau tied for first place but the Hawaiian’s highest single score gave him the win. World No. 5 Jordy Smith (ZAF) suffered a similar fate, losing to Wilkinson by a mere .06 points, despite scoring the heat’s best wave. Conner Coffin (USA) joined the list of shocking early exits in Round 3, as the Californian couldn’t match the power of Morais and flair in shifty supertubes. What an absolute disgrace Medina's priority tactics were in the heat against Callinan! What happened to sportsmanship? Totally. Medina may be a great surfer for a while but he's a dickhead for life. The interference should have gone to Gabby, as i said elsewhere he is as bad as Ol Robert. Toledo scuttled? Anyone looking at each of their 2 waves couldn't have given Duru that heat. WSL really have their own agenda. 'Eight to ten foot'sounds like a bit of a bold call, unless you left out all of the pictures of the big ones. Definitely a heavy wave on the right one though.